Why are we interested in Lime Rock? We're currently the Historian of Trinity Church in Lime Rock. We're active in the Friends of Beckley Furnace, a historical preservation group that is interested in the Barnum and Richardson Company, once headquartered in Lime Rock. And, we've Twice conducted heritage walks in Lime Rock for the UHVNHA. What unusual opportunity did Lime Rock present? Why do a heritage walk of Lime Rock? What's so special about Lime Rock? People make history. Were there any famous people in Lime Rock? Looking for a plot map of Lime Rock Cemetery? Please click here to learn more. We've photographed quite a few of the gravestones in the Lime Rock Cemetery and we've got pictures! We're planning to photograph more and make them available here too. Let us know if you are interested in a particular family or surname, and we'll see if we can find it! There are some different gravestones pictured on the CD-ROM, too. --The Lure of the Litchfield Hills - Volume III, no. 2, August 1931. This issue notably included a lengthy article about Lime Rock (in its days as an artists’ colony). See our Litchfield County page for more information. Early Iron Industry of Connecticut. We're happy to offer two articles by one of the earlier researchers of this subject in one download. Yes, there's material about Lime Rock in it! See our Iron page for more information. 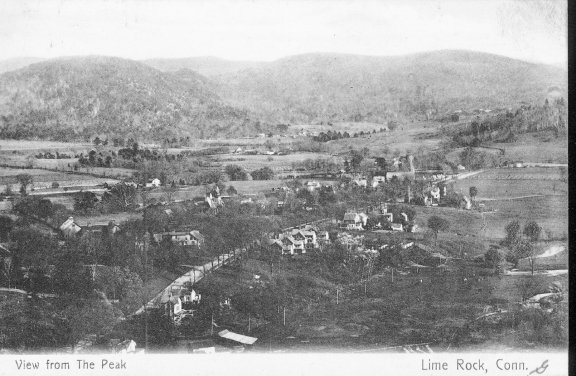 We're happy to provide for your reading pleasure an article from 1905 about Lime Rock and its history that was written by the then-Rector of Trinity Church. It's well worth reading and contains insights about the community that we've not seen elsewhere. Read the 1905 Gesner article about Lime Rock -- it's a free download! The White Oak for 1954, yearbook of Housatonic Valley Regional High School, Falls Village. Includes Lime Rock. See our Litchfield County page for more information. Usually we create a product in order to re-publish a major book or article of local history, genealogy, or Americana. We broke with tradition on this one. Just as we were delighted to support the Upper Housatonic Valley National Heritage Area (UHVNHA) by leading a heritage walk, we were fortunate to gain the sponsorship of Trinity Church in Lime Rock for the walk itself. They generously gave us free run of their spectacular (for a country parish church) facilities and helped us with logistical support and refreshments on the days of the walks. And, we were extremely happy to gain the active support of Lime Rock Park. That world-famous Lime Rock institution even provided a speaker, Ev Gamble, a track historian whose background goes back to the track's very beginnings. Over the centuries, Lime Rock has achieved more name recognition on a national level than any other Northwest Corner village, and for many good reasons. This walk will highlight some of them. Lime Rock was the headquarters and company town of Barnum Richardson Co., the preeminent manufacturer of railroad wheels, and the home of US Senator and Chairman of the Democratic National Committee William H. Barnum, at that time the wealthiest man in northwestern Connecticut. Walk participants will view sites of the "Golden Rod Cycle Track, " Lime Rock Cemetery, Lime Rock Park, the Lime Rock Casino, stores and hotel, among many others. To accommodate those who were not physically ready for the hike itself (which covered arount three miles), we also held two indoor activities that day. A showing of "Lime Rock Park: The Secret Valley of Racing" (this PBS video was nominated for 3 EMMY awards!). An hour-long slide show of Lime Rock history that we created. The slide show covered the same material the walk did, but it also includes much additional information and many additional sights. By popular demand, the showings of both the video and the slide show were repeated after the walkers returned from their trek. Later, we decided to offer the slideshow on a CD-ROM. When we discontinued our CD-ROM business, the slideshow became unavailable. "The Lakeville Crucifix" -- a detailed exploration of the conjunction of nativism, immigration, changes in American Catholicism, national and local politics, and local personalities to create a local incident that attracted international media attention. This book will be published in 2018. "A New History of Trinity Lime Rock" -- a church parish history that attempts to put the minutiae of small town parish life in its historical context. This book will be published in a 2019 - 20 timeframe. Portions of the vast amount of additional material unearthed in work on those two books seemed to fit naturally into our Lime Rock Walking Tour, as did some photos unearthed since the walks were conducted. So we did just that! The former slide show became a small book of around 140 pages which we decided to publish as a PDF download under the original title. So, here it is: the revised and updated Lime Rock Walking Tour! Download it now in PDF form for $5.00 -- a significant saving over the price of the CD-ROM it replaced. We've also set up an e-mail discussion group about the history of Lime Rock. It's easy to join. Just send an e-mail to limerock-subscribe@yahoogroups.com. It's free, and it's open to discussion of any aspect of the history of Lime Rock. it's a self-guided tour of that historic church with a distinctly historical perspective. to view it on Trinity Lime Rock's website. But don't forget to come back! Here's a super view of Lime Rock, taken from what must have been an cleared overlook above the Barnum and Richardson houses at the foot of what is now White Hollow Road (but then was Barnum Avenue). That peak is fully forested today, and we doubt a clear view could be found. Furthermore, the tree growth in Lime Rock itself would make most of the landmarks here invisible in today's photo. You can see where Lime Rock Park now is (the right hand portion of the picture, opposite Trinity Church), the meanders of the Salmon Kill back in the day (lower right corner), several of the company houses (note especially the cluster in the center of the photo), Charles Barnum's splendid "Hepzivalla" (to the left of center of the photo), but, unfortunately, nothing of downtown Lime Rock or the Barnum Richardson factory buildings (all out of the photo at the bottom). Lime Rock Park, of course would be on the right hand edge of the picture. --Delegates' Reports: CT Board of Agriculture (1869) -- The report from the Litchfield County delegate begins on page 21 of this document. See our Connecticut miscellany page for more information. Some Lime Rock exhibitors did especially well in an agricultural exposition held in Falls Village that is reported in this article.